MOUNT DESERT ISLAND — The Land & Garden Preserve on Mount Desert Island is pleased to announce several staff promotions. These changes will strengthen the team of seasoned professionals caring for the Preserve’s historic lands, gardens and facilities. Cassie Banning became the Preserve’s director of Farm and Gardens on Jan. 1. 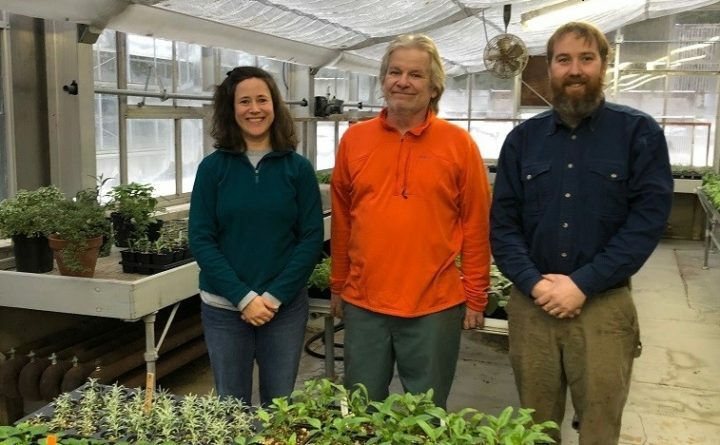 For the past three seasons, Cassie has been the manager of the Abby Aldrich Rockefeller Garden and McAlpin Farm, and for two years as the Abby Aldrich Rockefeller Garden manager. In this newly created position, she will now lead the horticulture at Asticou Azalea Garden, Thuya Garden, Abby Garden and McAlpin Farm. Cassie’s new role will give our farm and gardens more direct leadership and support our garden managers as we continue to tackle projects at all areas. On Jan. 1, Jon Knight, formerly the lead grower, became the manager of Abby Garden and McAlpin Farm. Jon has led the annual plant growing operation at McAlpin Farm since 2015 and will take over the management of the staff in both areas while continuing to advance plant production and trials at McAlpin Farm. Jesse Hartson began as the Preserve’s facilities director on Nov. 1, 2018, taking over from the recently-retired Doug Hopkins. Jesse will be responsible for maintaining the Preserve’s 40-plus buildings and structures. He has been caring for the grounds and buildings at the Abby Aldrich Rockefeller Garden and McAlpin Farm since 2012. The Land & Garden Preserve is a non-profit organization located in Seal Harbor and Northeast Harbor, Maine. The mission of the Preserve is to share the beauty of historic lands and gardens on Mount Desert Island. The gardens are comprised of the Abby Aldrich Rockefeller Garden, Asticou Azalea Garden, and Thuya Garden. The Preserve manages natural lands from the head of Northeast Harbor, across Little Long Pond, and east to Hunter’s Cliffs in Seal Harbor. These lands include a vast network of hiking trails and nearly ten miles of carriage roads. The lands and gardens managed by the Preserve are open to the public. For more information, contact the Preserve at 207-276-3727 or visit www.gardenpreserve.org.